The Wonderful Wizard of Oz ~ DID YOU EVER NOTICE...... ? * . . .small angle gaps don't match up in certain scenes ? This was because the editors were told to knock out specific lines or scenes from the film so it could stay under 2 hours NOTE: originally UNDER THE RAINBOW was cut from the film. Good sense was prevailed and it was restored. * . . .Frank Morgan shows up 5 times in the film ! First as Professor Marvel, The Doorman, Cabby Driver, Guard at the Gate and the FIRST WIZARD, DELUXE ! *. . .that the Witch's castle was either a matte painting or a miniature set during a view of a long shot. * . . .that none of the film was shot on location ? Production at 1060 was filmed entirely on set stages ! * . . .when the Wizard tells them to GO! The Lion runs out of the throne room and BERT LAHR's STUNT DOUBLE runs into th window and crashes it ! * . . .Judy Garland's stand in Bobby Koshay, opens the door into Munchkinland in a GREEN GINGHAM DRESS ? Judy THEN stepped OUT of the HOUSE ! * . . .the Lion's bottom, when climbing the rocks to get to DOROTHY and set her free, is STRAIGHT ? THE TIN WOODMAN is holding his tail-watch this CLOSELY, it's funny ! * . . .for a Scottish Terrier, Toto is SMART ! * . . .periodically, throughout the film characters are MISPLACED in sequence. EXAMPLES: Hail to Dorothy for Klling the Wicked Witch of the West - pay CLOSE ATTENTION TO THE LION ! 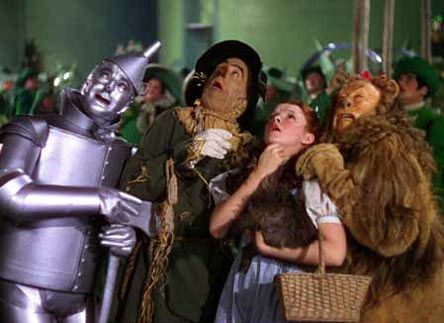 THEN, when the Lion, Scarecrow and TIN WOODMAN confront Oz to get their medals - WATCH CLOSELY AT THE LINE UP. Out of sequence once more ! * . . .the Scarecrow's MATH equation is WRONG ! * There is no hanging man in the back of the Tin Woodsman scene. Inside of one of the behind the scenes books of this movie it specifical tells you a story f of how animals in their cages got loose on the set. Therefore, in the background you see a bird flapping it's wings, thee is no hanging man! * A deleted scene was cut from the movie, The Jitterbug, is mentioned when the Wicked Witch tells the Flying Monkeys : " I've sent a little insect on ahead to take the fight out pf them ! " Unfortunately, it was never fully shot because Buddy Ebson was the Tin Woodsman at the time, and Jack Haley eventually took his place. 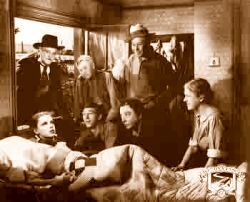 Only rehearsals of this scene still exist in the documentary of the 1939 dvd and video. fairy tales have followed childhood through the ages, for every healthy youngster has a wholesome and instinctive love for stories fantastic, marvelous and manifestly unreal. The winged fairies of Grimm and Andersen have brought more happiness to childish hearts than all other human creations. Yet the old time fairy tale, having served for generations, may now be classed as historical in the children's library; for the time has come for a series of newer wonder tales in which the stereotyped genie, dwarf and fairy are eliminated, together with all the horrible and blood-curdling incidents devised by their authors to point a fearsome moral to each tale. Modern education includes morality; therefore the modern child seeks only entertainment in its wonder tales and gladly dispenses with all disagreeable incident. Having this thought in mind, the story of The Wonderful Wizard of Oz was written solely to please children of today. It aspires to being a modernized fairy tale, in which the wonderment and joy are retained and the heartaches and nightmares are left out. Oz has to be the most imaginable place where virtually every fan wants to go. From Dorothy's first steps into this magical fairyland to the forty sequels, this novel has spawned. Oz became one of the most quintessential stories of the young at heart for over 105 years. OZ would be rereleased to theatres, creating more generations of people to fall in love with this endearing classic and under it's endearingly, magical spell. Seventeen years later marked the first visual concept put into the family home, the first black and white television set. In 1956, 1939's Wizard of Oz debuted on television for the first time, eventually color television made a huge impact with this spectacular film in the 60's. Thus, OZ made history once more, it was the very FIRST movie to ever be seen on television, Since 1956, this movie has become an annual classic, an icon for the twenty and what is now, twenty-first century. Back in 1999, The Wizard of Oz celebrated 60 years of television enchantment. This annual classic had been on television for 60 years, and it's no wonder that the year before in 1998 THE WIZARD OF OZ went BACK into theatres ! 5 years ago, in the year of 2000, The Wizard of Oz shown brightly, and consequently it was known that 100 YEARS of OZ had passed since it's FIRST publication in 1900. Many fans of every generation from young to old and the young in heart followed this timeless masterpiece down the Yellow Brick Road one more time on television on the cable network TNT. Now, in January 2005 we can begin to celebrate the 105 years of OZ officially into the 21th century. The HISTORY to this story is magificent, and it is here within my world of OZ, I will share with you the reader, everything I know, and MORE about the ULTIMATE BEST NOVEL & MOVIE ON EARTH, PLUS THE REASON WHY I LIVE, AND LOVE The inspirational WONDERFUL WIZARD OF OZ ! Step inside to the magic, behind the scenes, all about the authors and illustrators, sequels, deleted scenes, Academy Awards, comparisons to DISNEY FEATURE FILMS ( my other passion) and MY FIRST OZZY EXPERIENCE at the tender age of 3! There are many similarities in Gregory Maguire's Wicked to L. Frank Baum's Wizard of Oz. But, where in fact do they lie? The very first Oz book by Baum depicts a crochety old woman patched with one eye, drawn by W. W. Denslow. In Wicked, the Life and Times of the Wicked Witch of the West described by Gregory Maguire himself is a green woman from birth to death. She was scorned, defeated, and internally incomplete within herself. So where do the similarities lie? It's not only a story about Oz. It's a story about friendships and heartaches, along with what makes Oz such a wonderful place to understand where you be. Both Wicked and The Wizard of Oz share the bond of friendship. Galinda and Elphaba find solace within each other as do Dorothy, Scarecrow, Tin Man and the Lion. But one thing sets each story different. Their destiny. Dorothy longed to return home. Elphaba died. Elphaba's story is tragic, but it's true no one mourns the wicked. But, was she wicked? Gregory Maguire proved she wasn't just really messed up and misunderstood. However, 1939's movie proved otherwise. You see a truly horrible menacing creature emerge from a utopia of Oz. Still, in both versions Elphaba demands the shoes belong to her. In the Broadway play Wicked's ending is depicted as a suicide attempt to rid herself to get what she wants, her love of Fiyero. In the Wizard of Oz it is clear the bucket of water in the background was there, yet did not seem intentional when Dorothy spilled the bucket of water on the Scarecrow when it accidentally hit the witch of the west. Munchkin Boq in the 1900 book of Oz was where Dorothy stopped and asked to stay the night. In Wicked Munchkin Boq transformed into the Tin Man. Wicked also suggests the Scarecrow is Fiyero when in fact the 1939 film states the Scarecrow is to rule the Emerald City after the Wizard leaves. Such stories of truths we'll never know. There are more to divulge and talk about. Tell me about what you have noticed in these stories, let's talk and share Oz, get down to the fact of it. Oz is an amazing country. The Wizard of OZ was a novel written by L. Frank Baum in 1939, this wonderful novel became a beloved movie that generation after generation still loves to watch over and over time and time again. I am part of a new generation that fell for this timeless masterpiece. The year 1980 marked my very first showing of this movie. It enchanted me in every way possible. I was 3 years old at the time and it was the very first movie I ever watched with my mother beside me. The Wizard of Oz is my favorite movie and I have read the entire series of books by L. Frank Baum from cover to cover many times. I also found myself involved with Oz and its magic, imagination & creativeness, the authors and their many works. Truly these masterpiece Oz series is one of the best children's books of all time ! 1999 marked the movie's official anniversary. 60th years in running and 2000 made another anniversary for OZ. THE STORY WAS 100 years old ! (now 108) Next year marks the 70th Anniversary of the Wonderful Wizard of Oz on the big screen. May another 100 years hold a TREASURED classic forever. Liza Minnelli provides voice of Dorothy guest voices: Ethel Merman as Mombi, Paul Lynd as Jack Pumpkinhead, Margaret Hamilton as Aunt Em, Milton Berl as Lion, Danny Kaye as Tin Woodman, Mickey Rooney as Scarecrow plus others ! Jim Henson Productions provides all of the animatronics . Loosely based on The Marvelous Land of Oz and Ozma of Oz . 01/01/1887 Baum`s father dies. The Baum family moves to Aberdeen, South Dakota. 1891 Moves to Chicago with his family and works as a reporter for the Evening Post. THE WONDERFUL WIZARD OF OZ, 1900 - Ozin velho/Oz-maan taikuri - Film adaptations: The Wizard of Oz (1925), dir. by Larry Semon, adapted by Semon and L. Frank Baum Jr,. starring Dorothy Dwan - The Wizard of Oz (1939), dir. by Victor Fleming, starring Judy Garland. It has dwarfs, music, Technicolor, freak characters, and Judy Garland. It can't be expected to have a sense of humor as well - and as for the light touch of fantasy, it weights like a pound of fruitcake soaking wet. (Otis Ferguson in the New Republic, September 20, 1939) - The Wiz (1978), dir. by Sidney Lumet, written by Joel Schumacher, starring Diana Ross and Michael Jackson. - Under the Rainbow (1981), starring Chevy Chase and Carrie Fisher, dealt with the backstage misfortunes of the filming of the 1939 classic. - Walt Disney's Return to Oz (1985) was based on The Land of Oz and Ozma of Oz. When I saw this movie I was razzled and dazzled by how richly enchanted it truly was, the heroine's name was Dorothy Gale and I secretly wanted to be her. A few years later I found found my very own grandmother's name was Dorothy, and actually believed she was the real Dorothy who did go to Oz. That's why now, I want to dedicate this webpage in honor of her, my first favorite Dorothy in my life, Nana I love you. American journalist and writer, whose best-known book is The Wonderful Wizard of Oz (1900). Baum's stories about the imaginary Land of Oz belong to the classics of fantasy literature. The Oz series was long shunned by librarians, and neglected by scholars of children's literature. Baum has often been compared to Lewis Carroll - they both had a girl as a protagonist in their most famous works. In 1873 Baum became a reporter on the New York World. Two years later he founded the New Era weekly in Pennsylvania. He was a poultry farmer with B.W. Baum and Son and edited Poultry Record and wrote columns for New York Farmer and Dairyman. In New York Baum acted as George Brooks with May Roberts and the Sterling Comedy in plays which he had written. He owned an opera house in 1882-83, and toured with his own repertory company. In 1882 he married Maud Gage; they had four sons. Baum made his debut as a novelist with Mother Goose in Prose (1897). It was based on stories told to his own children. Its last chapter introduced the farm-girl Dorothy. In 1899 appeared Father Goose: His Book, which quickly became a best-seller. Baums next' work was The Wonderful Wizard of Oz, a story of little Dorothy from Kansas who is transported by a twister to a magical realm. The book, which was illustrated and decorated by W.W. Denslow, was published at Baum's own expense. The first of the Oz books was made into a musical in 1901. Since its appearance the story has been filmed many times. Other novels in the series were The Marvelous Land of Oz (1904), Ozma of Oz (1907), Dorothy and the Wizard of Oz (1908), The Road to Oz (1909), The Emerald City of Oz (1910), The Patchwork Girl of Oz (1913), Tik-Tok of Oz (1914), The Scarecrow of Oz (1915), The Lost Princess of Oz (1917), The Tin Woodman of Oz (1918), The Magic of Oz (1919), Glinda of Oz (1920), and The Visitors from Oz, which was adapted from a comic strip by Baum and appeared in 1960. Baum's former illustrator W.W. Denslow produced stories with Oz characters in the early 1900s. In 1914-15 Baum was the founding director of Oz Film Manufacturing Company (later Dramatic Features Company) in Los Angeles. During his career Baum wrote more than 60 books, some of them for adults, including The Last Egyptian (1908). He gathered material for works aimed at teenagers during his motoring tours across the country and travels in Europe and Egypt.